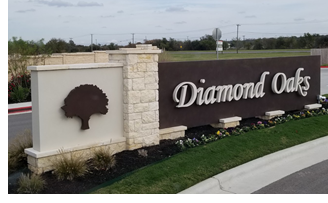 ​​​​ ​ROUND ROCK – A 29.68-acre mixed-use development called Diamond Oaks is underway at 3750 E. Palm Valley Blvd. Carr Development broke ground on the 13,545-sf retail portion on Jan. 29. The commercial portion still has roughly 4,600 sf available and is expected to be complete by fourth quarter 2019. The residential portion will include 120 homes by Blackburn Communities. The La Quinta hotel will be complete by early 2020.